TENS : (Healthmate $ 29.99) It is a small battery-operated device that relaxes the muscles by modifying painful sensations with the electrical impulses. Costlier versions include more programs with different intensity and part and is along with additional therapeutic modalities like EMS, IFT and ultrasound. It is one of the best ways to reduce dependence on opioid of pain medications. Recurring costs may include electrodes. Read my post on how to increase the life of electrodes. Check out the YouTube video review here. 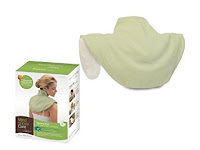 Microwavable Heating Pads : (Mind and Body Neck and Shoulder Wrap $ 19.99) For minor aches and pains especially around the neck, shoulder and back region. The important thing about them is their convenience. You can heat it up in a microwave in a few minutes and get soothing heat that will keep you warm and the muscles relaxed for 20 minutes at a time. Check out the YouTube video review. 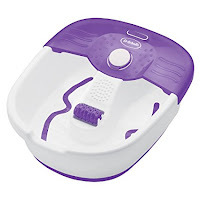 Foot Spa : (Dr Scholl's Invigorating Pedicure Foot Spa $ 49.94) In my opinion, you cannot go wrong with foot spa as a gift. It's a fast and convenient way to relax while watching TV at the end of the day. There are plenty of options available. I prefer this one because it is durable and has bubbles and a rolling massager. Costlier versions include jet stream, vibration massagers etc. 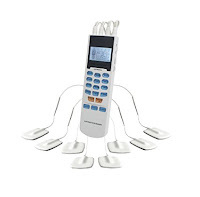 Self Massager : (Body Back Duo Massager Bundle $ 34.95) According to this study, trigger points are the major cause of disability in the working age population. These are especially useful for fibromyalgia patients. I use them on a daily basis for cervical and upper back pain. I like this particular brand because of the lighter weight. Check out the YouTube video review. Price : $ 19 - $ 40. Backjoy : (Backjoy $ 39.99) Instead of purchasing expensive chairs, you can first try this. It adjusts your pelvis so that your posture is properly aligned from the right up to the crown. I have found it very useful during car rides. In fact I'm sitting on it right now as I compose this post. Check for various options for individuals with different weights before you make a selection. You can read my video review here. 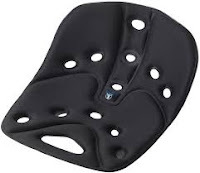 Posture Brace : (Mycarbon Posture Corrector $ 19.99) These should really be recommended more by health care providers. Most people who have used bought this on my suggestion reported that they breathe and sit better after using this. 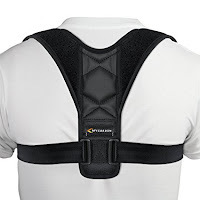 Costlier versions will include support for the back. However, I recommend starting with the cheaper version and then move on to the expensive options after several months of the year of usage. Check for actual sizes before making the selection. Tablet Stand : (Tablift Tablet Stand $ 39.95) From learning to entertainment, video content is increasingly being consumed through Internet using mobile devices. However, this also means hours and hours of looking down at tablets/mobiles. Avoid injuries like Computer Neck Syndrome by using tablet stands. Check out the video review here. If you are using this mostly for entertainment, I would rather suggest purchasing a smart TV like Roku $149.99. This way you can at least move around periodically while binge watching your favourite shows. 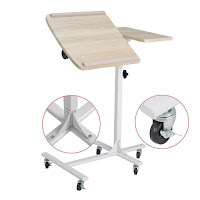 Adjustable Table : (Vogue Carpenter Laptop/Overbed Table $ 37.99) Adjustable table uses are not limited to using it as a laptop or an over the bed table. The main feature is its mobility and height adjustibility. I have used it as a dinner table when I was unable to look down at the meals because of severe neck pain. I have also used it as a adjustable support for mobile holders like this. It can also be used as a way to transfer items from one room to another for a patient who cannot lift even a few pounds of weight. Price : $ 39 - $ $ 44.99. 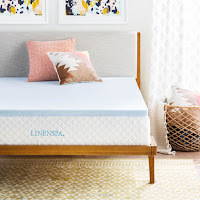 Memory Foam Mattress Topper : (LinenSpa 2 Inch Gel Memory Foam Topper $ 42.99) It is a cost-effective way to get better support during sleep without purchasing expensive mattresses. Costlier versions will have more gel thickness and more memory foam density. Marketing will have you believe that it can convert the sagging mattress into a luxury bed. Instead consider it as a way to extend the age of the old but still decent (not sagging) mattress. 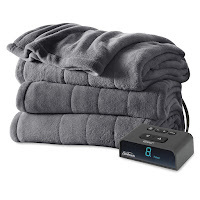 Heated Electric Blanket : (Sunbeam Micro Heated Blanket $ 44.99) Patients with arthritis, fibromyalgia and backache will particularly benefit from this. 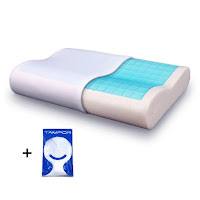 Cervical Pillow : (Tampor Contour Gel Cervical Pillow $ 40.99) A must have for any patient with neck and shoulder pain. This is suitable for both side and back sleepers. It will help a person who sleeps on the stomach but that is really not a recommended way of sleeping. There are several brands available. I have owned different ones in the last several years and each of them worked equally well. Just make sure it has a proper contour and firmness. Gel has not made much of a difference to me. Bed Wedges : (Brentwood Zuma Therapeutic Foam Wedge $ 39) Anyone with chronic pain should own at least one of these. They are very useful in acid reflux which can be a side effect of pain medications. 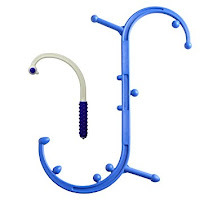 These are also used for better posture in the bed. Speech Recognition : (Dragon NaturallySpeaking Home 13 $ 48.91) Applicable only for the Windows desktops. This has been a standard choice in speech recognition for two decades. 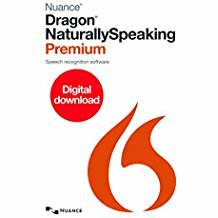 Even though Windows provides a free speech recognition program, the accuracy level still does not match that of Dragon NaturallySpeaking. The home version is sufficient for a person for the email, web surfing and word processing. I am people to use the computer only because of speech recognition. However, I use the premium version. A significant part of this blog is devoted to free video tutorials on learning to do relatively complex tasks with the software. Mouse Emulator : (Logitech HD C525 $ 29.99) Allows hands-free control of the mouse. The web cam, when paired with the open source software like eviacam, recognises the movements of the face and moves the mouse accordingly. Almost all laptops come with an integrated web cam. However, it will be of use only if you are working on the laptop directly. That is a bad choice for people with chronic pain due to the poor posture. A better way is to hook up a monitor to the laptop and then mount the web cam on top of the monitor to control the mouse. 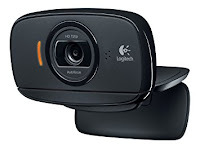 In my experience, a standalone web cam is usually much better in recognition as compared to an integrated web cam, especially in low light. I am glad you liked the post. 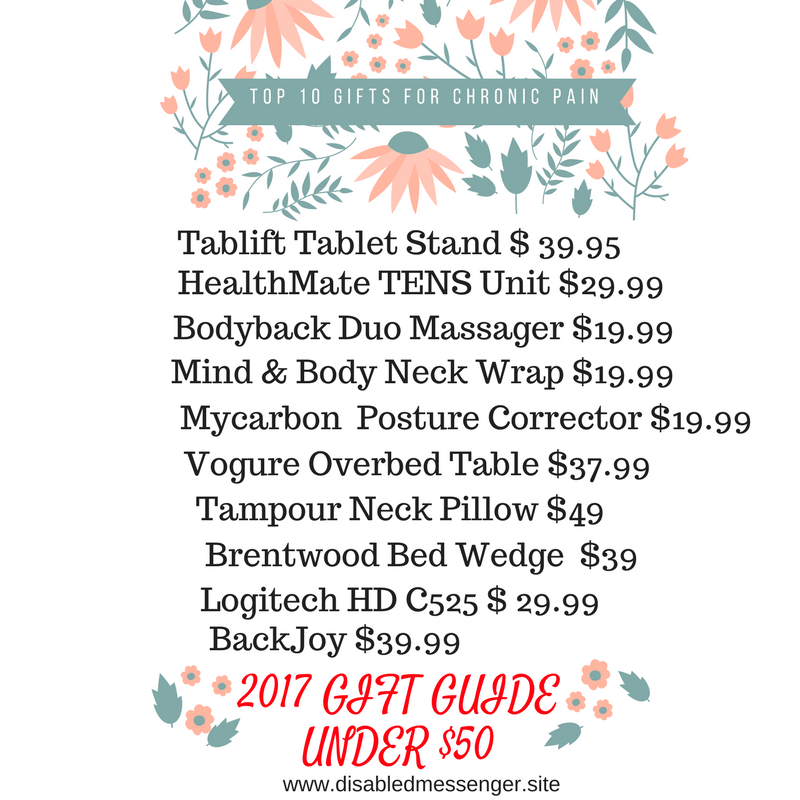 You can check out a similar post for gift items under $100. 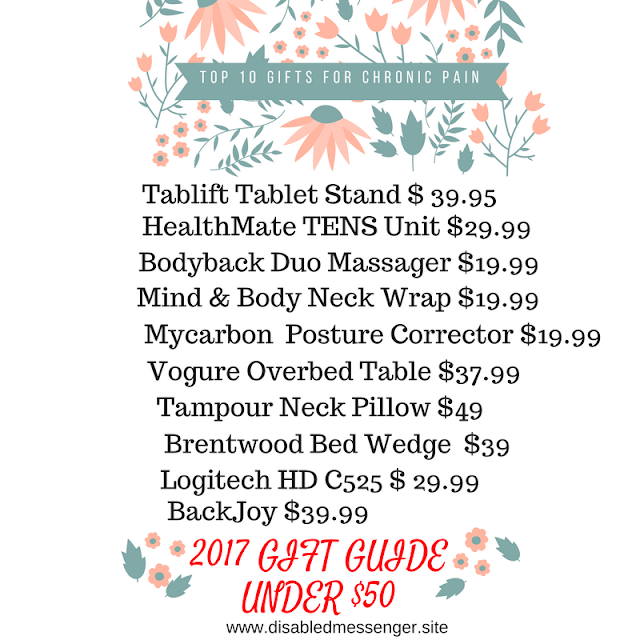 http://www.disabledmessenger.site/2017/12/top-10-gift-ideas-under-100-for-chronic-pain.html.